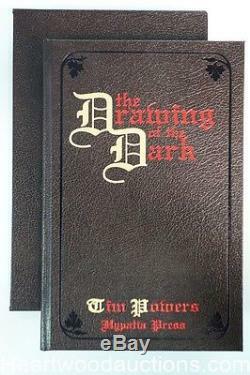 The Drawing of the Dark by Tim Powers Signed, Limited 1991. Book Condition: Fine - A Beautiful copy. Features: Signed by James P. Jeter (Introduction), and Tim Powers (Author). Limited to Seventy copies in Dark brown leather, matching slipcase, numbered from I to LXX. Sixty-four copies offered for sale. Interior Artist: Hypatia Press (Design and Artwork by the Publisher). The item "The Drawing of the Dark by Tim Powers Signed, Limited- High Grade" is in sale since Thursday, September 8, 2016. This item is in the category "Books\Antiquarian & Collectible". The seller is "pulp2515" and is located in Fort Lauderdale, Florida. This item can be shipped worldwide.